The total value of outstanding student loans has nearly tripled in the last eight years--and 17% that total value is owed by people over the age of 50. These and more disturbing facts are apparent from a presentation by Donghoon Lee of the New York Federal Reserve on "Household Debt and Credit: Student Debt," given last week as part of the quarterly release of data on overall household debt and credit trends. Start with the big picture. 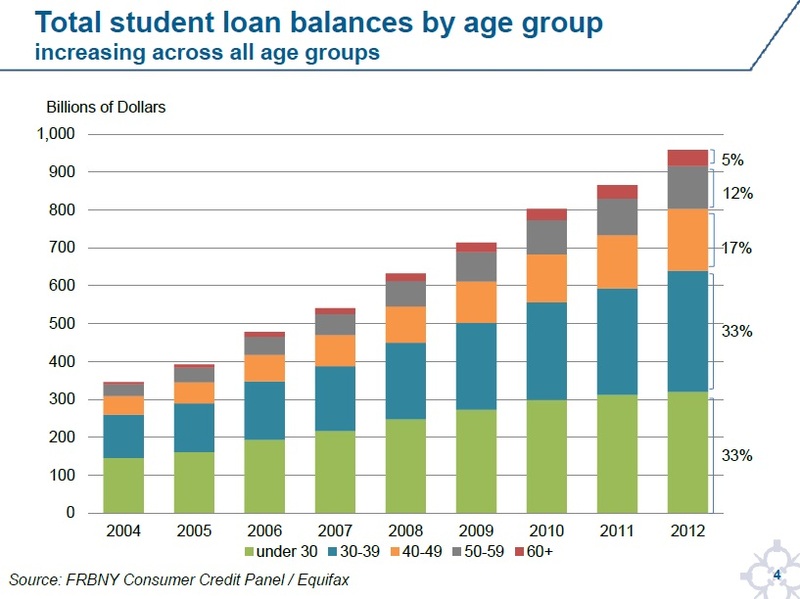 Total student debt outstanding has risen from about $350 billion in 2004 to $950 billion by fourth quarter 2012. One-third of that debt is owed by people over the age of 40, and shockingly, at least to me, 5% is owed by people over the age of 60. Other kinds of debt like credit card loans, auto loans, and home equity loans are down from the peaks they hit just before the recession, while student loans are way up. 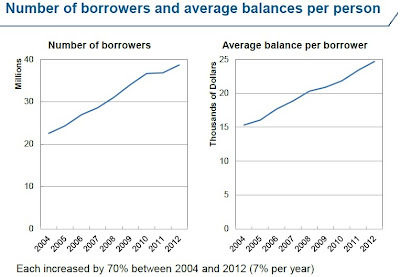 The increase is built on more students taking out loans each year, and the average balance per borrower is rising. Perhaps not surprisingly, given these borrowing trends combined with poor job prospects and continued high unemployment, the rate of delinquencies on loans is up. This is measured in two ways. Some borrowers are not yet "in repayment," because they are able to defer their loan for some reason--like they have continued on to another degree. 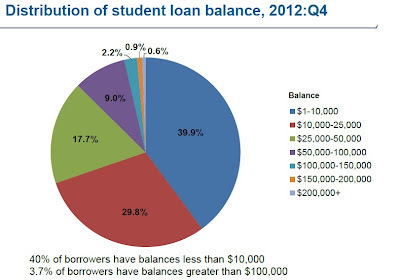 The figures on the right don't count the loan as delinquent if you aren't yet "in repayment." 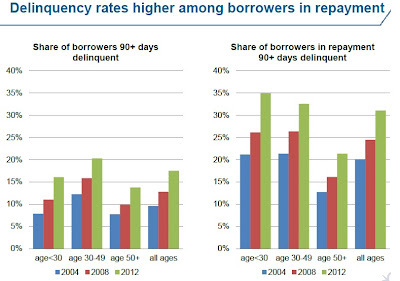 But for those in repayment, on the right, about one-third of all borrowers are more than 90 days delinquent on their payments, compared with one-fifth back in 2004. To me, the difficult issue with student loans is that, on average, they are still a good deal, in the sense that on average the income gains from a college education make it possible to repay the average loan and still to come out way ahead. 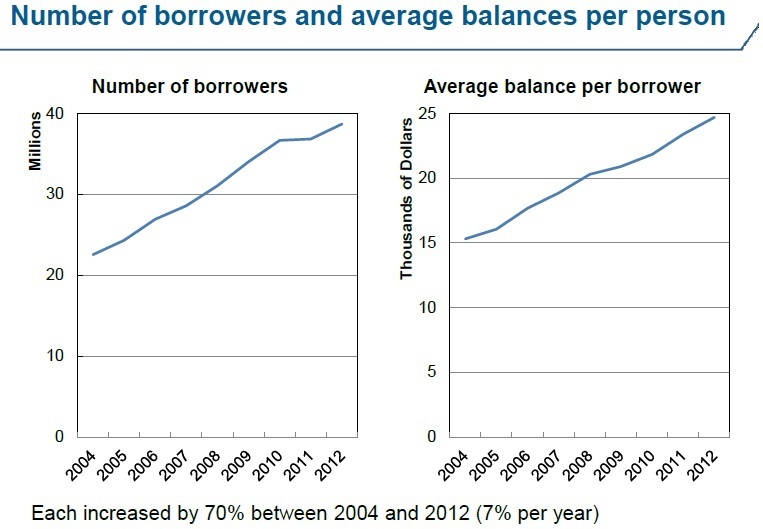 But of course, not everyone is borrowing the average amount. One-eighth or so of borrowers have more than $50,000 in outstanding loans, and 3.7% have more than $100,000 in outstanding loans. Here's a distribution of how much student debt people have incurred. Not everyone will earn the average income of a college graduate, either. Those who borrow to fund a year or two of higher education but then don't complete a degree, for example, are less likely reach that average. Those who attend certain schools with poor job placement records, or who major in areas that typically have limited job prospects or low average pay, are going to have a tougher time. 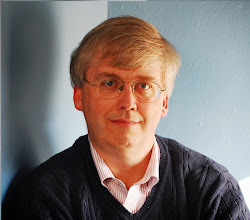 As a father of teenagers, I'm acutely aware of the fail-safe parenting rule: "Just don't let them screw up their lives before the age of 20." Very large numbers of young people--if not still teenagers, still in their early or mid-20s--are in grave danger of screwing up their financial lives even before they are launched in the adult world of work. Borrowing for higher education is on average a good deal, but there's often a lot of cheerleading around the student loan process, too. If students are going to be on the hook for these loans, they need to be made aware of how their choices about how much to borrow, where to attend, and what to study affect the risk of ending up delinquent on the loan.